I’m planning on fishing my first Muskie tournament this year. 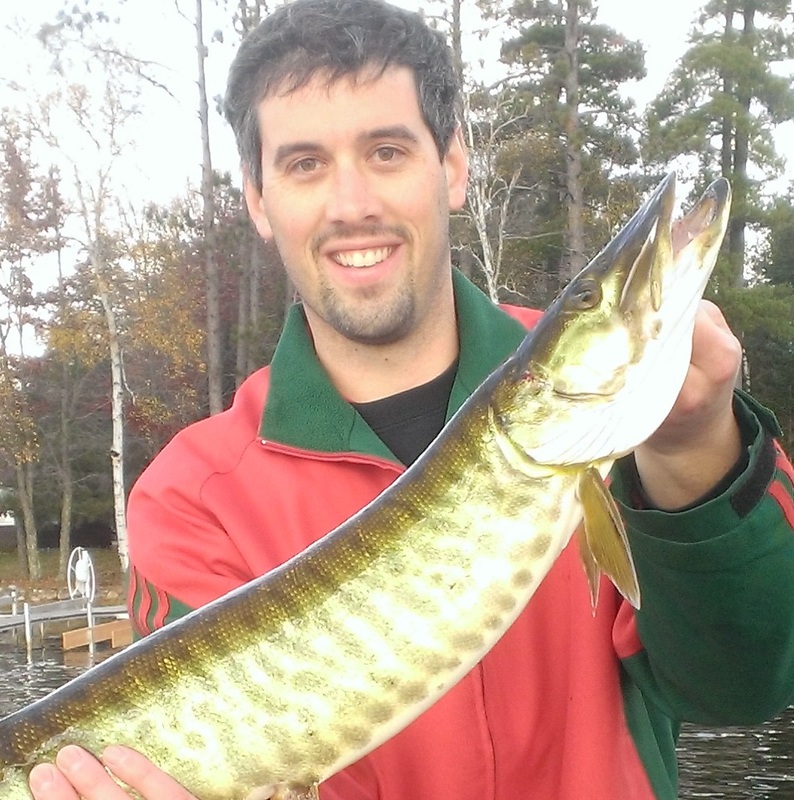 The Rhinelander Hodag Musky Challenge is held each year up in September on various lakes around Rhinelander. Based on results from the last several years catching two legal (40+ inch) muskies will put you into the top 3, and cash prizes are awarded to the top 10 finishers. This is a really a great opportunity for muskie fishermen because as long as your doing what you can correctly, anyone can get lucky twice in two days. On the other hand, it shows how challenging musky fishing can be – about 3 of the 80 or so teams will actually manage to land two of the fish. 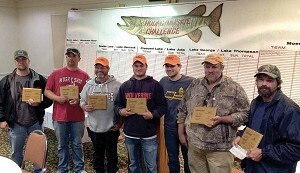 Winners of the 2014 Rhinelander Toyota Hodag Musky Challenge (from the left) third place, Matt Rollins and Brad Rollins; first place, Scott Denzer and Kevin Douglas; Rhinelander Area Chamber of Commerce Executive Director Dana DeMet; second place, Jason Mollen and Todd Havel. 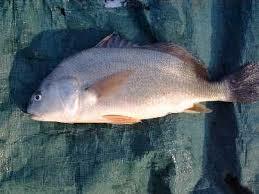 The reason for this is pretty simple – how can you expect to release a 40+ inch fish crammed into a 30 inch livewell? It’s probably not going to work. 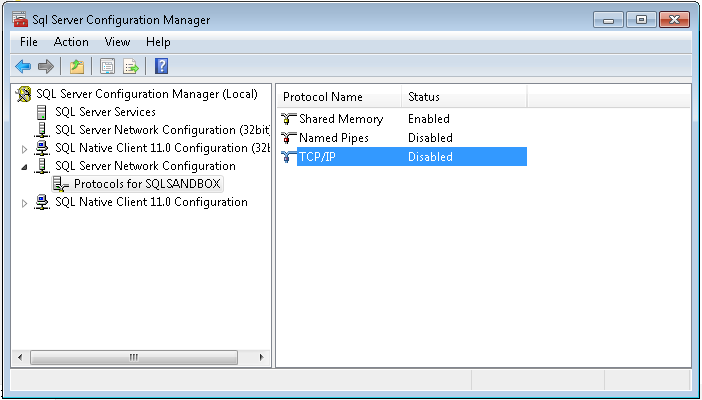 You can see SQL Server will not let us create this primary key because it’s too big. What if the CatchDescription was VARCHAR(1000) instead of CHAR(900)? This time the primary key was successfully created. However, this has created a very dangerous situation. If someone tries to insert a value larger than 899 bytes into the CatchDescription or update an existing value in that field to a value larger than 899 bytes, SQL is going to stop them. 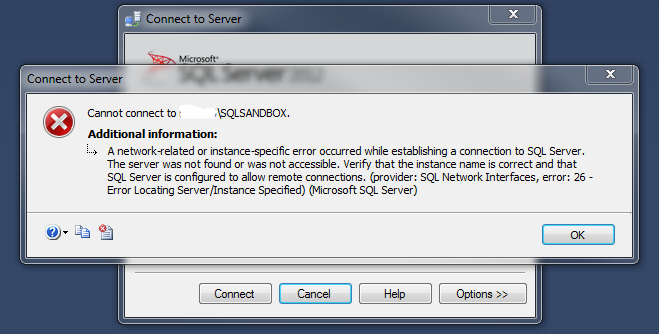 This is a great example of the notion that just because SQL Server lets you do something doesn’t mean that you should. It can be a daunting experience to try fishing a new lake. We can see what the lake looks like from above the water, but below there are innumerable structures and features to consider. Last summer I fished lake Winnebago for the first time with my pop and brother. Lake Winnebago is the 21st largest natural lake in the United States, covering about 215 square miles. As we motored out from the boat launch, the only thought was “where to start?” The vast lake was stretched out before us, but since we could only see the top of the water we had to use other clues to figure out where to start fishing. After running, I was able to find the /DECRYPT password part of the command, which I used to decrypt and view/edit the packages using BIDS. In the image below, you can see the password is “ssis”. A few summers ago I was fishing a very clear lake up in Oneida county, WI for muskie. Oneida county and the county just to the north of it, Vilas county, offer some of the best muskie fishing in the Midwest. It was a hot, calm day with not a cloud in the sky. These types of conditions are usually not very good for muskie – they are ambush predators and prefer low light conditions or stained water so they can close in on their prey without being noticed until the last second. I was fishing a deep weedline with a deep-running crankbait. As I was reeling in I felt the dull tug of weed getting caught in the hooks of the lure. I gave a sharp tug with the rod to try and free the lure, but the weeds would not let go. As my lure limped back to the boat, I was surprised to see a good sized muskie following the lure even though it was surrounded by the weeds it was dragging. One fun thing about muskie is their willingness to attack lures right next to the boat, and for this reason the seasoned muskie angler will swim the bait in a circle a few times at the end of each retrieve (commonly called a figure-eight). Although I was sure the fish wouldn’t hit the fouled lure, I still went into my standard figure-eight. I was surprised and completely unprepared as the muskie shot forward and grabbed the lure, still full of weeds, about a quarter way through my first circle. I had a split second decision on which way to try the hookset, and I made the wrong one. I tried setting the hood back against the direction the fish was moving, but I ended up striking the side of the boat with my rod, and the fish dropped the lure and swam off. I had made a wrong decision, and had to live with losing that fish. Fortunately when deciding whether or not to use Sparse columns in SQL Server, we don’t have a split second decision – we can experiment to see whether they are a good fit for our particular tables. That last point is pretty important because you can often get significant space savings with compression. The main downside of compression is the extra CPU usage required when working with these tables, but that’s another discussion altogether. Adds a new column to the table with the new storage size and format. Rebuilds the table or clustered index to reclaim the space used by the old column. 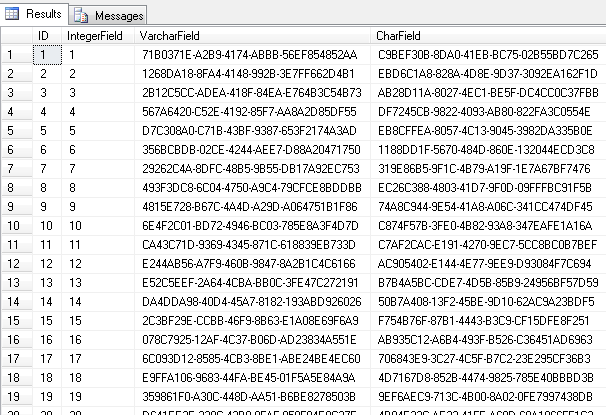 It’s important to remember there is a row size limit in SQL Server that is 8060 bytes for tables without Sparse columns and 8018 bytes for tables with Sparse columns. If changing a column from nonsparse to Sparse violates these limits, the change will fail. 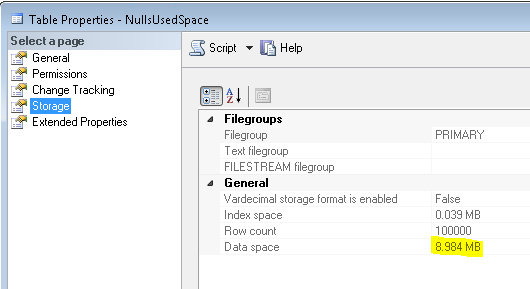 From a storage perspective, Sparse columns work by not storing any data for columns that have been marked sparse and are NULL. 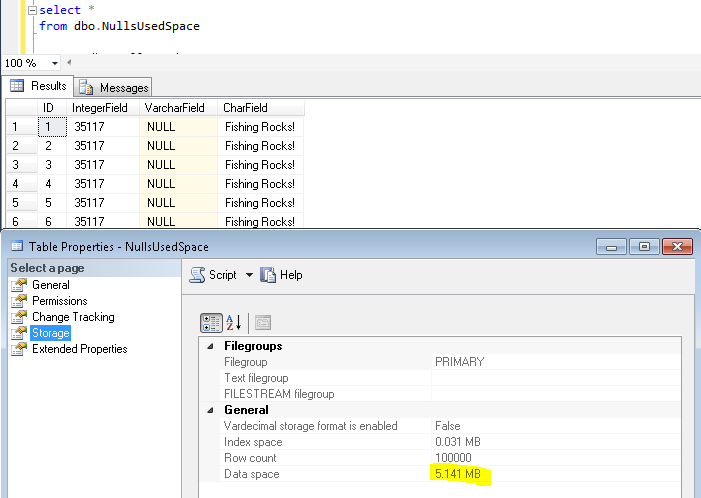 However, in order to store values in Sparse columns that aren’t NULL, SQL server has to not only store the value, but also what column is holding that value. This causes the size required for each non-NULL value to increase by 4 to 8 bytes (for example, non-NULL integers increase from 4 to 8 bytes). Now that I’ve hopefully provided a little background on what Sparse columns are and how they work, let’s look at an example. I have created a table with 1 million records in an integer field. I found I did have to rebuild the table before I was able to see the change in used space. 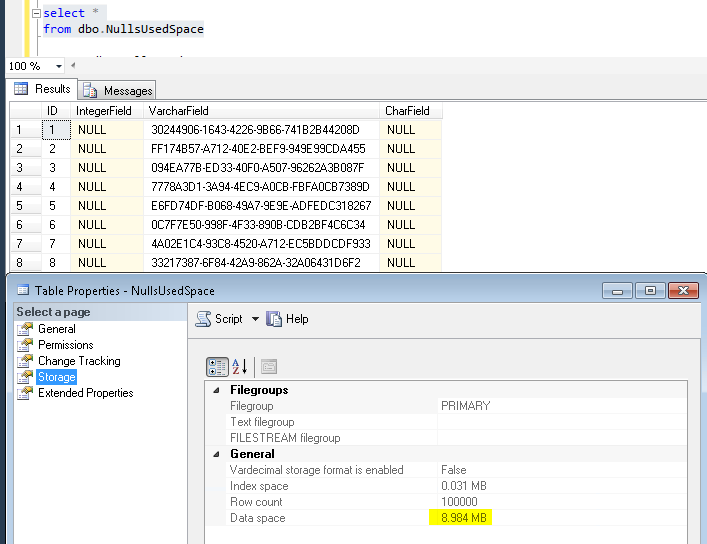 Now our table with the Sparse column with no NULL values has ballooned to 28 MB! The size has shrunk to approximately 4 MB, to 24 MB. Next I change another 25% of the values to NULL. 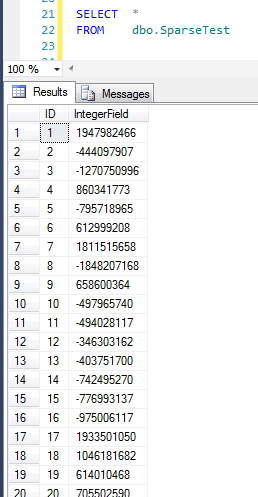 Now half of the values in the table are NULL. The size has shrunk another 4 MB; we are now down to about 20 MB for the entire table. I update another 25% to NULL so now 75% of the values in the Sparse column are NULL. We now see the table size is down to 16 MB, the same size as when the column was nonSparse. One last update puts the table down to 12.5 MB. 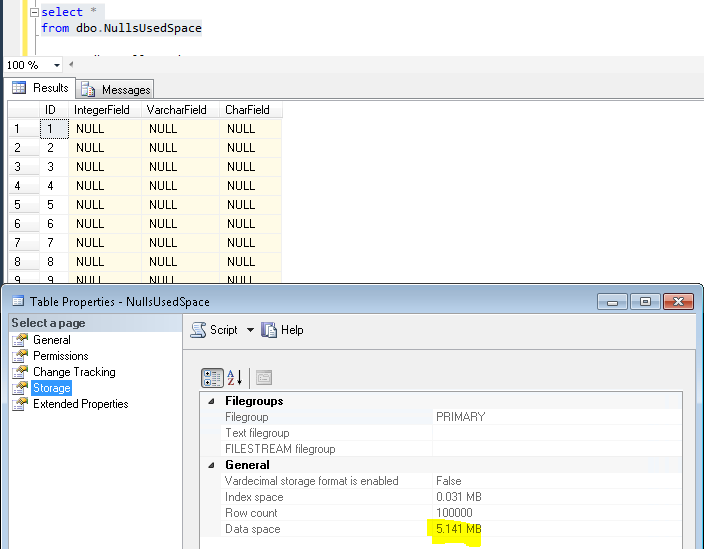 So this demonstrates the size differences of the entire table based on the amount of NULLs in a Sparse column. The real lesson here is to experiment with Sparse columns on your tables if you have many NULL values, but understand that you need to check to make sure making columns Sparse does indeed reduce the amount of space used. And don’t forget, this isn’t a one time decision. The percentage of total values in a table that are NULL can change often; don’t be afraid to track the NULL percentage over time to make sure you are keeping your table optimized. Before each muskie fishing trip I go down into my basement and choose which lures I want to bring with. You see, muksy lures are BIG, and I have many more lures than fit inside my tackle box. I need to plan which lures will probably be most effective depending on where I will be fishing and under what conditions (weather, season, water clarity, etc.). I may choose to use every slot in my tackle box, or to just grab a few proven lures and leave the rest of the slots empty. However, whether I choose to completely fill my tackle box, or just bring a few lures that I really trust, my tackle box is still going to take up the same amount of space in my boat. 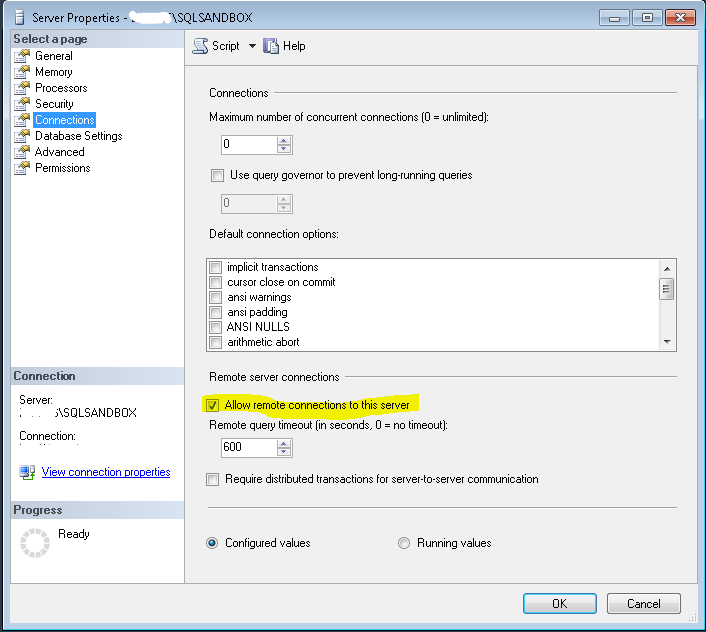 Fixed length fields in SQL Server work the same way. No matter what value (or lack of value) is in them, they take up the same amount of space. I check out the size of the table and find it at almost 9 MB. Next we update the table and set all CharField and IntegerField to NULL. For one last double check, let’s add the integer and char values back into the table to verify the size is still the same. So there you have it! Again, this was a pretty simple concept. 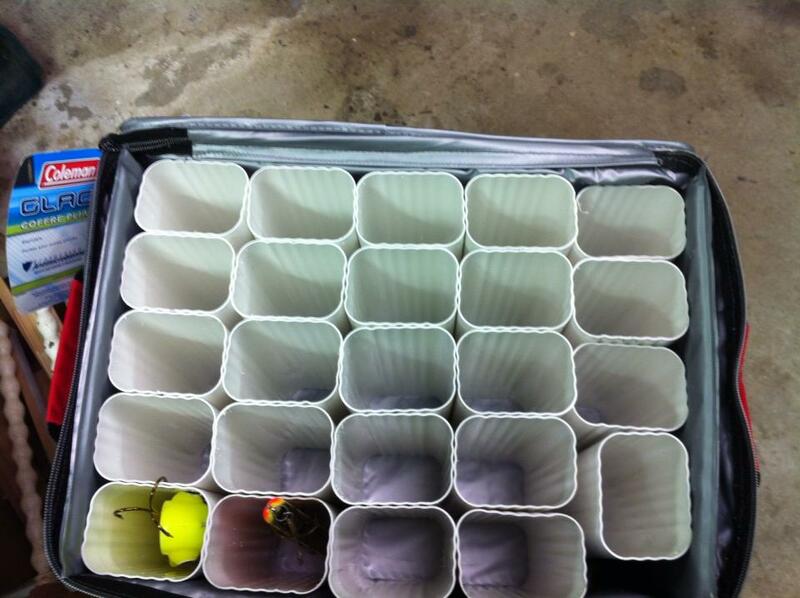 This demonstration proved that NULLs take just as much space in a fixed length field as any other value does, just like an empty tackle box takes up just as much space in a boat as a full one.